I want to work on a separate project in which I can freely experiment with balance and tactical concepts from the ground up. Hunter Gatherer is a light infantry specializes in taking down ice age animals, and traversing difficult terrain on foot. Hunting Wolf is a light response infantry that specializes in taking down infantry, most effective in packs of up to 5 individuals or in support of hunter-gatherers. A light ranged unit, provides support to hunter-gatherers and wolfs, able to take down light non-stone structures with its flaming arrows. An allied trooper from the future sent back to foil soviet plans. This one focusses on your animal units and is able to send enemy animals into temporary rampage against their soviet trainers. A high tech allied trooper from the future sent back to erase soviet presence, this one focusses on de-evolving enemy infantry to a fightable standard, and erasing heavy units and structures. Tribal camp for training hunter gatherers, wolfs and dogsleds. For calling in true vehicles. (terror drones etc) This structure has a built in tesla coil in which operates and defends the gate. Most effective in support of Keepers - helps deter wolf attacks. The most bland - yet most useful response/defense unit. Best available unit to counter Chrono Movement. Causes low local damage at close range. Trample Damage. The medium organic tank, likes to destroy true vehicles the most. Causes high local damage at close range, Trample Damage, Tank/Infantry Crusher (cant crush rhinos) The heavy tank, slow moving, Kirov-like tank. Likes to destroy everything, but ineffective vs hunter-gatherer. I will expand on these ideas as concept further develops, and I begin to implement/ produce graphics. This should be in Private Mods section, not media hut. Just a few frames for now - a start at least. Only modern domesticated dogs have raised tails, which has been breed in to them for our own aesthetics. In contrast wild dogs/wolfs/big cats have their tail lowered most of the time so they are less viable to their prey. I think he look more aggressive like this. What would your tail do Mig? 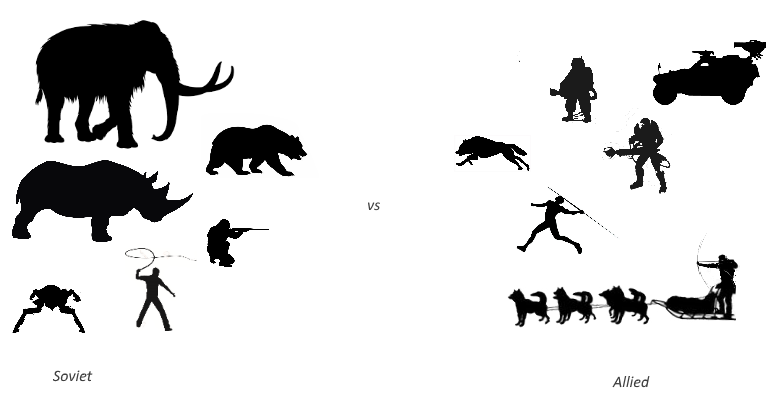 If you were an Ice Age wolf face to face with a Chrono-Legionaire with an adrenaline shot and dog treats? 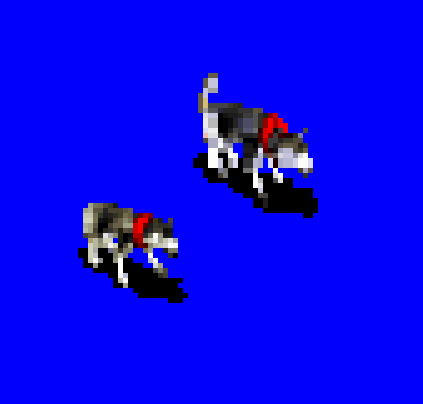 I will likely be using the tail-down dogs for the Dogsled, which I am hoping to Frankenstein out of age of empries assets. ^^^ See the way the wolf attacks. I will try to do this, it lunges into the cell. This will be how this dog will attack animals he cant "Jump into"
Maybe the unit on top should be higher tech? Instead of an archer? Or maybe I an IFV? Is possible to do SHP turrets on IFV?? Is possible to make these turrets appear to be infantry attack frames? SO appears as though infantry is standing on the sled? What a nice idea. I never see ancient themed mod for long. About the wolves, you could make them more gray all around.